Congressman Joe Walsh says if Trump loses, grab a musket. 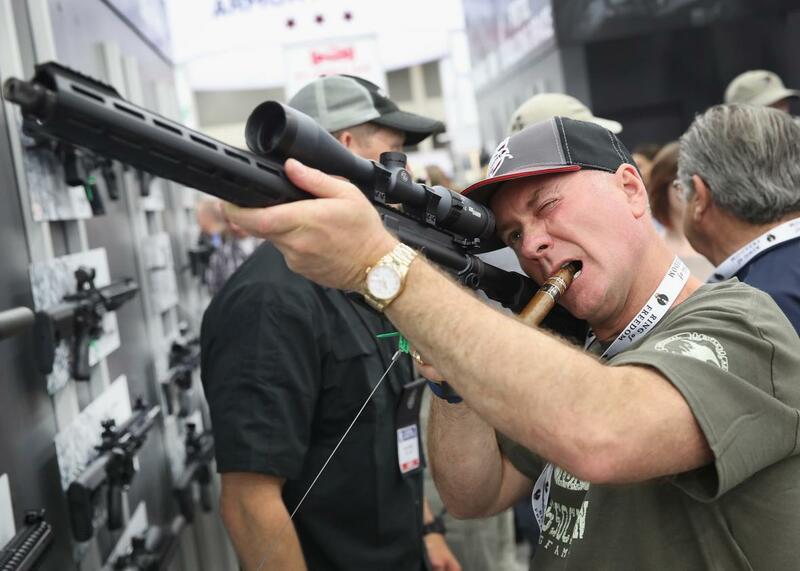 A man (not Joe Walsh) points a rifle at a gun show. The Republican Party has embraced the “insurrectionist” theory of the Second Amendment, which holds that individuals should violently overthrow an overly oppressive government using firearms. Walsh frequently says horrific things on Twitter, and it may be tempting to write off this latest proclamation as his standard fevered lunacy. But as I noted in August, this sentiment—that a Donald Trump loss might justify the violent overthrow of a Hillary Clinton administration—is really just the logical endpoint of a longtime GOP talking point. The National Rifle Association has longed peddled the “insurrectionist” theory of the Second Amendment, arguing that the right to bear arms was intended to protect citizens against a tyrannical ruler. According to this theory, individuals must have access to firearms in order to revolt against an overly oppressive government. The purpose of the amendment, then, isn’t merely self-defense, but a right to assassinate a leader who unduly restricts liberty. Although this insurrectionist theory is entirely made up and utterly foreign to the Supreme Court’s interpretation of the Second Amendment, it has gained a foothold in the Republican Party. In 2010, Republican Senate candidate Sharron Angle suggested that Nevadans might use “Second Amendment remedies” to punish an overly liberal Congress. In 2014, Iowa Republican (and current senator) Jodi Ernst proclaimed that she had a right to defend herself and her family “from the government, should they decide that my rights are no longer important.” During his campaign for the presidential nomination, Texas Republican Ted Cruz asserted that the Second Amendment provides “a Constitutional right to protect your children, your family, your home, our lives, and to serve as the ultimate check against governmental tyranny—for the protection of liberty.” And of course, in August, Donald Trump implied that “Second Amendment people” might murder Hillary Clinton should she appoint liberal Supreme Court justices. Given the GOP’s embrace of the insurrectionist theory, Walsh’s statement should not be at all shocking. In a follow-up tweet, he clarified that he was encouraging “protesting. Participating in acts of civil disobedience. Doing what it takes to get our country back.” Under his party’s view of the Second Amendment, “doing what it takes to get our country back” includes assassinating political leaders whom one deems to be oppressive. Oppression, of course, is in the eye of the beholder. And the GOP has already primed its supporters to fight back against whatever oppression Hillary Clinton might bring—muskets at the ready.